The period from 1867, the year of Confederation, to 1914 is generally seen as the time when Canada truly became a nation of diverse immigrants. It is said that immigration not only provided "much of the population growth" for this period, but produced a nation no longer British and French, a nation with a "wide variety of ethnic origins". From this point onward, we are told, the equal "contributions of the other ethnic groups" to Canada's history became undeniable. Facts barely support this interpretation, and, what is worse, the historians who write eloquently about this diversification inform us this was a time when Canadians imposed immigration restrictions against "any race deemed unsuited to the climate or requirements of Canada", a time when WASPs were unwilling to share Canada with races deemed to be very different, excluding them altogether by the early 1900s. 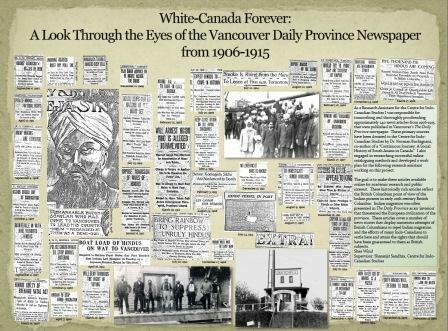 It was a time, they teach students, when dominant Anglo elites forced back to India the Komagata Maru ship (in 1914) amid cries of "White Canada forever". Of course, some may argue that actual diversification is what prompted these immigration restrictions, that the arrival of thousands of Asians and blacks was indeed creating a new Canada that was stopped in its tracks by "racist" Whites. But we will see, to the contrary, that Canada become more White during this period and that it was the threat, rather than the fact, of diversification that brought immigration restrictions. Current diversity promoters want to have it both ways: find justification in the past for the intense racial diversification that is going on today, as a way of normalizing its radical nature, while condemning this past for marginalizing minorities and excluding non-Whites. They act as the moral arbiters of a Canada that apparently failed to live up to ideals that only they are bringing to actualisation now. But we have seen in preceding articles on this topic that the evidence stands in the way of any such moral grandstanding. Instead it reveals academics accustomed to the manipulation of historical evidence to fit current diversity goals. In the years prior to 1896, nothing had been more disheartening than the country's failure to attract and keep the large number of people necessary to fill up [western Canada]. In fact, thousands had emigrated out of Canada; in 1870 there were 493,464 Canadians living in the United States, and, all in all, between 1871 and 1891, more emigrated from Canada to the US than had come from abroad. On the surface, it all seems rather diversifying as we are informed that 8000 "Russian Mennonites" settled in Manitoba in 1874, that over 15,000 Chinese arrived to work on the transcontinental railway in 1879-80, and that 247 Jews came to Saskatchewan. But arguing on the basis of these numbers that immigration accounted for "much" of Canada's population growth is quite misleading. The population of Canada grew from 2,414,519 in 1851 to 3,174,442 in 1861 to 4,009,000 in 1876, and to 4,833,000 in 1891. The population of Quebec grew from 890,00 to 1,489,000 through this period. It is a fact, however, that most of the Quebec growth was due to the continuing high fertility rate of the French population. And it is also a fact that immigration played a relatively small role in the overall growth of the Canadian population during this period. When all is said, the historians agree that it was really in the period between 1896 and 1914 that Canada saw a high influx of immigrants, "more than 3 million" new settlers. There is no doubt that immigrants, particularly if we correctly include their children, did play a very important role in the population growth Canada experienced from 5,074,000 in 1896 to 7,879,000 in 1914. Mind you, if you look at these numbers carefully, even assuming that some of these immigrants emigrated to the US, and that some died, the total increase in population from 1896 to 1914 stands lower than the alleged number of immigrants who arrived in Canada, which leads one to think that the immigration numbers have been exaggerated, since the number of Canadians should have been considerably higher in 1914 if we take account of the domestic fertility rate. The "more than 3 million" figure comes from J.M. Bumsted (2011). It looks like J.M.S. Careless, in his 1959 book, Canada: A Story of Challenge (I am using the 1965 edition), has the more accurate number of "about two-and-a-half million people" (p. 304) entering Canada between 1896 and 1914. It appears that current historians, in their eagerness to portray Canada as a "nation of immigrants", are inflating the numbers and miseducating their students. Bumsted's other figure of "nearly 2.8 million immigrants" arriving in the "peak" decade of 1904-1914 (2011, p. 262) appears to be inflated as well. The population between these years grew from 6.1 million to 7.89 million, which is lower than than the supposed number of immigrant arrivals. The next question is whether the immigrants who came during this period added to the ethnic diversity of Canada. They answer is yes, insomuch as the number of Canadians with a European ethnicity other than English and French increased. However, the White racial homogeneity of Canada was increased, and Germans, which made up about 6% of the Canadian population in 1871, remained the largest proportion of "other Europeans". Reading the standard texts, including the Report of the Royal Commission on Bilingualism and Biculturalism, Book IV, The Contribution of the Other Ethnic Groups (1970), students may think that diversification after 1896 was the order of the day. We are told that 7500 Doukhobors, members of a sectarian Quaker-like movement from Russia, arrived on and after 1898; and that between 1896 and 1914, 170,000 Ukrainians settled in the prairies. We are informed that, by 1921, 15 percent of the Canadian population was non-British and non-French, that the Polish population increased from 2,800 to 32,000 between 1901 and 1921, that Hungarians numbered 13,200 in 1921, that Italians increased from 11,000 in 1901 to 67,000 in 1921, and that Jews increased from 16,100 to 126,000 in the same period. We are also told that, in 1921, the Chinese numbered 40,000, the Japanese 16,000, East Indians 5,000, and Lebanese 4,134. And that the German population in the prairies increased from 46,800 in 1901 to 148,000 in 1911, and that Canadians of Scandinavia origin in the prairies increased from 17,300 in 1901 to 130,000 in 1921 (Brown and Cook, 1974; Friesen, 1984, pp. 242-273; Bumsted, 2011, 2003; Report of the Royal Commission, pp. 17-31). 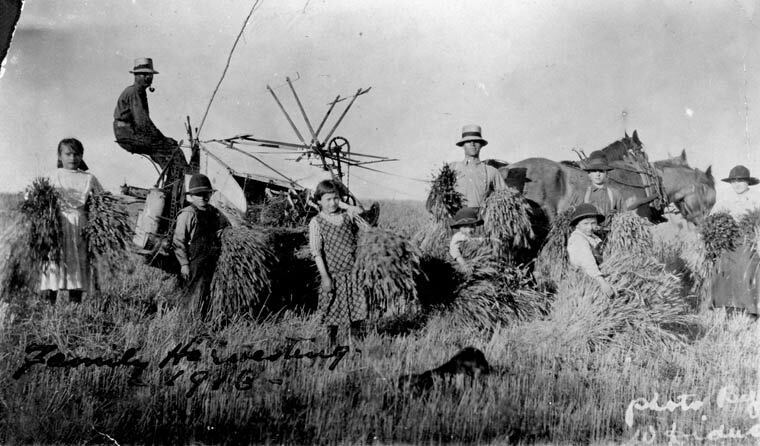 Many of these immigrants settled in the underpopulated prairies, Manitoba, Alberta, Saskatchewan, and so it is quite accurate to say that "cultural diversity" became a "striking feature of prairie society" during this period (Friesen, p. 242). Yet we must keep in mind some key facts, starting with the intra-European character of this diversity. We must also realize that these numbers are relatively low compared to the total number of immigrants who came during this period, even though some of these numbers take into account children of immigrants, that is, they are counting the ancestry of Canadians and not just actual immigrants. When we look at total number of immigrants coming to Canada as a whole, assuming that "more than 3 million arrived between 1896 and 1914", we find that 1.25 million came from the British Isles, including 50,000 "home children", and 1 million from the United States. 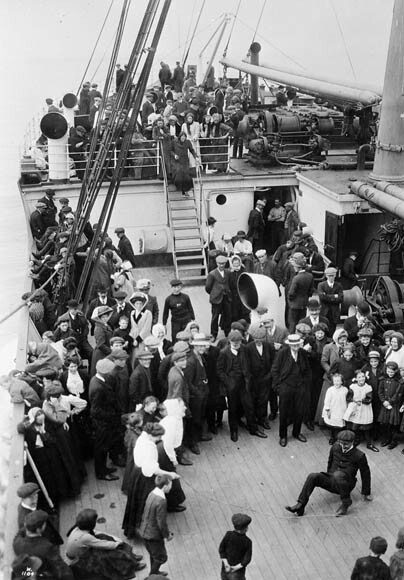 Most of the Americans were Canadians returning from the US some years after they had emigrated from Canada. Careless, who says that 2.5 million came between 1896 and 1914, also says that "close to a million" were from the British Isles, "more than three quarters" from the United States, and "well over half a million" from continental Europe (p. 304). The number of blacks who came in 1871 was 21,500, but after this peak the numbers decline; less than 1500 blacks came from 1901 to 1911, or only 1000+ blacks came to the prairies between 1909 and 1911. Thereafter, as a result of immigration restrictions, hardly any blacks came until the 1960s. Similarly, the Asian population peaked in the early 1900s, but Asian immigration was stopped altogether by the Chinese Immigration Act of 1923. Immigrants from India were completely prohibited after 1907. In 1931, the total Chinese population in Canada, which was the largest Asian population, was only 46,519. You cannot have it both ways. You cannot tell students that immigration and diversity have been an unique feature of Canada's history hidden by past historians, and now uncovered by current historians, while insisting simultaneously that the very period, 1896 to 1914, which supposedly saw the "greatest immigration boom yet known", was a period in which "virtually no Canadians", to use the words of the popular text, Destinies: Canadian History Since Confederation, "thought in terms of a culturally pluralistic society" (p. 69). Was this the period in which Canada saw "record" numbers of immigrants from a "variety" of nations, or was it "instead" a period in which the government "sought to create a homogeneous culture based on British Canadian customs and the English language" (p. 69)? Was this a period in which "racist" immigration acts were introduced prohibiting Asians and blacks from entering Canada, or was it a period when Canadians from many ethnic backgrounds increasingly made equal contributions to Canadian society? Remember, when the establishment decided to identify Canada as a multicultural nation in the late 1960s, rather than a bicultural nation, it did so on the grounds that this term was a more accurate description of the "contributions made by the other ethnic groups" through Canada's history. But having examined the history of immigration from the origins of Canada in the early 1600s up until 1921, we have seen that only in this late period can we identify "other Europeans" as a growing proportion of the Canadian population. These "other Europeans" came to participate mostly as farmers and workers within a Canada that was politically, economically, and culturally dominated by English speakers, and, in 1921, Quebec continued to be created by the racially homogeneous Quebecois. During this sequence of centuries, the Aboriginal population had been continuously reduced, consisting of only 1 percent of the population by 1867, and declining further in absolute numbers until the early 20th century. There is no way around the reality that Canada was created, and continued to be created through to 1921, almost entirely by native Whites and by internal White migrants from British North America and the British Isles, with a late incoming contribution by other Europeans after 1896. The country, in fact, became Whiter during this period: 96 percent of the population was of European origin in 1901; 97 percent in 1911, and 97.5 percent in 1921. Historians who tell you today that "from the very beginning, the land that became Canada was a multiracial place, the destination of a constant flow of new immigrants of varying ethnicities" (Bumsted, 2003, p. 326), are violating a most basic principle of their profession, that is, the formulation of arguments by carefully considering the evidence, rather than twisting the facts in the name of make-believe ideologies that have no grounding in reality.